Many bacteria found at the bottom of the ocean glow in the dark thanks to light generated by their internal chemical reactions. This makes it easier for fish to see and eat them — which is exactly what the bacteria want. 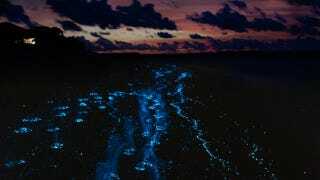 Researcher Margarita Zarubin of Israel's Interuniversity Institute for Marine Sciences put together an ingenious experiment to see how bioluminescent bacteria benefit from their heightened visibility. She placed two groups of bacteria — one that glowed in the dark, and the other that had had this ability genetically suppressed — in a seawater tank full of shrimp and other small marine organisms. The shrimp only took any interest in the bioluminescent bacteria and began dining on them. Two and a half hours later, the shrimp were now full of glowing bacteria, so much so that their own stomachs had become luminescent. Zarubin then took the glowing shrimp and some normal counterparts and released them into a flume full of hungry cardinalfish. These fish chowed down on the shrimp, but again they were only interested in the glowing ones. Zarubin and her team then had the rare pleasure of sifting through the cardinalfish feces. They discovered that after all this, the original glowing bacteria were still very much alive and had passed through both digestive systems completely unscathed. Like Japanese snails, the bacteria allowed themselves to be eaten so that they could be transported further across the ocean than they could ever travel unaided. Of course, the group that doesn't seem to benefit at all from this process are the poor shrimp, who get one last meal before being devoured by cardinalfish. Zarubin speculates that the luminescence — and thus their increased visibility to predators — is just something the shrimp and other deep sea organisms have to risk on the ocean floor, where food is scarce and a random glowing bit of bacteria is about as good a meal as you can hope for.